These dog sled tours are a great way to see our winter wonderland! 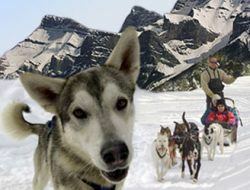 The most popular dog sled tour, the Great Divide Tour, departs from Lake Louise, just a few minutes drive from the Fairmont Chateau Lake Louise, and about 40 minutes drive from Banff. This is the only dog sled company permitted to operate in Banff National Park and the Great Divide Tour will take you over the Continental Divide into Yoho National Park. Most guests will ski at the Lake Louise Ski Area and dog sled in the same day. Dog sled tours are also available from Banff but travel time is required to get to the dog sled departure location which is outside of Banff National Park, near Canmore.